Today's shot will be the vertical obstruction at 17 yards. Place an object on both sides of the kill zone and make your shot count. Prayers for all the folks being impacted by Florence...God bless and be safe! Vertical Obstructions @ 17 Yards. Waited for fog to lift a little. Shot was a tad right but still in lungs. Thanks for the call and have a great day. I hesitate to even post this!!! Finally bought a couple of those foam noodles just for this shot. Thanks for the call. Jim' you're still a good shot you probably envisioned my arrow in the bulls eye and my yellow nock made you nervous. Great shooting Jim you missed the obstructions. 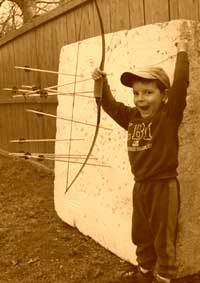 I have been shooting one arrow, but things felt good this morning so I hogged the target....Ha!Ha! Sorry guys, my neighbor ran a batch off his stil and he gave me a jar full.....Apple moonshine 90 proof, it's for my arthritis. Shot as called, just a little right of where I was looking. Shot with the 50lb Montana. Shot as called. I had trouble getting to full draw with the injured pointer finger so I hurried this FS. I was looking at the golf T.
Afterwards I tried several with two under leaving a gap as if my pointer was in the stack. I was able to shoot several good shots so I may have to use just the two fingers for awhile. Healing is going well thankfully. I used some super glue yesterday to help pull the outer cut together. the cut was in a bad spot for gripping. Thanks for the call Big John! FS is the top arrow. Sage and German spruce. Thanks Big John and y'all have a great day. Does that firewater come in a tablet? Good shooting yesterday. I was late getting in my shot and even later posting. Thanks for the call Big John. Taken with a 1964 Drake lefty. A bit lower than intended .